The 2019 AFP Store Catalog is now online and ready for your last-minute Christmas shopping needs. You’re sure to find something in these 15 pages to suit any friends or family interested in real news, truthful information and honest history. From the ancient world to today’s news and events, alternative health to the Zapruder film, AFP’s books, CDs and videos cover it all. Other available products include such items as China-free vitamin C products, CDs of interviews and audio books as well as a high-quality portable CD player to use in listening to them or your favorite radio show, and DVDs covering topics from health to conspiracies. Don’t miss the special bonus gifts offered on page 13! But you must hurry and place your phone order by tomorrow to receive your gifts by Christmas. Normally, we answer the AFP phone lines Monday through Thursday, but this week we’ll have operators standing by tomorrow to accept your last-minute Christmas orders. Call (202) 544-5977 or (888) 699-6397 toll free now to ensure your U.S. order will be delivered by Christmas at our normal low shipping rates. After tomorrow, we’ll need to charge expedited shipping rates to ensure timely delivery. You may also place your order online through the AFP Online Store, where all of these products are also available: Click here to go to the AFP Store. 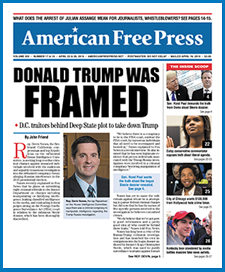 Of course, you can’t go wrong with the gift of a subscription to American Free Press, and now you can SAVE 50% off the normal cost with our 2019 gift subscription: Only $29 for a full year of our biweekly, 32-page newspaper delivered to a U.S. address AND available to read online in digital format! And best of all, whether you purchase products from our catalog or newspaper subscriptions, your purchase helps ensure AFP starts the new year on a stronger footing, ready and able to continue bringing you cutting-edge, no-holds-barred reporting throughout 2019 . . . just as we’ve done every issue since our founding in 2001. From all of us at American Free Press, thank you for your continued support! We wish you and yours a Merry Christmas and a Happy New Year! !